Good morning Cybertron! After another flood of Sharkticons poured through, we’re now ready for the new event for 2/17/17-2/19/17. It’s clean up aftermath this weekend, so not huge or super exciting prizes, but hey, we’re getting something and some exp, right? Grab your alliance team mates and help get those scraps from the Sharkticons out of your bases! Have fun! Til all are one! 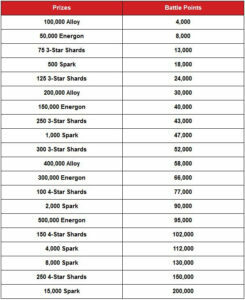 Be the first to comment on "Weekend Earth Wars Report: Working the Sharks Out"